I received an e-mail asking if I'd like to participate in a blog tour for a new novel recently released by Tyndale. I read just a little bit about what Thicker than Blood was about and thought it sounded interesting, so I agreed to review the book. I really don't make a habit out of participating in blog tours just for the sake of participating in them. If I'm going to spend time with a book, I want to know that there's a good chance that I'll enjoy it. In this case, I'm glad I said yes because I did enjoy it as a fun, engaging and entertaining story. Thicker than Blood is primarily the story of Christy Williams who is trying to run away from her messed up life. Essentially, she is trying to find a place where she can belong but where nothing will be required or expected of her. Her past mistakes include running away from her fifteen year old sister immediately after their parents were killed in a car accident, falling in and out of bad relationships and becoming an alcoholic as a result of it all. Christy longs to reconnect with her sister, May, but guilt over her past actions are holding her back. Boiled down to the basics, this book is a redemption story. Normally a book like this wouldn't necessarily capture my attention but this one did for a variety of reasons. The character of Christy is an antiquarian book buyer. Her sister, May, is part owner of a ranch and is fiercely independent and something of a go-getter. The book includes some pet topics of mine, including issues surrounding abortions. It is a believable story and interesting. Now, another habit of mine, when I receive a book with a press release attached to it, is to ditch the press release and read the book first. I never pay attention to who the author is or what the publisher thinks of the book. I just want to focus on reading the book for myself so that I can provide an honest assessment based on my own personal opinion. It was with some surprise that I later picked up the press release for Thicker than Blood and realized that the book's author, C.J. Darlington, is a former home schooled student. She began writing this book at the age of fifteen. Having been home schooled myself, this particular piece of information caught my attention. For me, the fact that she's home schooled is not the selling point of this book. But it does make advertising it more interesting if you point out this fact. How so? Home schoolers frequently are subjected to rounds of questioning as to whether or not they can be successful in society today or whether or not their education can be as effective as a "traditional education" (i.e., an education received in the classroom). I've said before that I don't believe home schooling is for everyone. At the same time, I see it as a very viable and attractive option for schooling. It is nice to be able to point out to people that home schoolers can actually succeed in life. Having a book picked up and published by Tyndale is no small matter and it is something that C.J. Darlington should take delight in. Even more so though, the greater delight should be taken in writing well and for the glory of God. Delight should be taken in using the creativity one is gifted with and creating something uniquely different for people to enjoy. A writer should also strive to expresses the grandeur of the Giver of such a gift and Darlington does that in this book. I would say that C.J. Darlington has promise. She has written a compelling tale, made somewhat more interesting to me because of her background, coupled with the subject matter she dealt with. My upbringing was not so very different from hers and if the best advice is to "write about what you know" then Darlington excelled in writing this book. Why? Because she wrote a lot about a lifestyle she didn't personally know but dealt with it in a mature manner that is believable in its expression. I've seen a few unbelievable stories written by conservative home schoolers because it's hard to write believably when you are sidestepping life issues that are tense and unpleasant in nature. I applaud Darlington for not avoiding sin or downplaying it but for writing about it in an honest and straight forward manner. She's still very discrete - don't get me wrong! But she mentions various behaviors that others in her position would have would have been tempted to leave out all together, for convenience sake. Truly, I think this book is a great accomplishment, speaking as a home schooler who spent most of her life moving in very conservative circles. This book is believably good. So much so that, pardon if you don't understand this, I'd almost not mention C.J. was home schooled. For some, that will send the wrong message. For others, it will send the right one. For my part, I give it a thumbs up and would thank Darlington for giving it her all. It's obvious she did so and therefore I find myself with no qualms at the conclusion of Thicker than Blood . It was a pleasure to read and a pleasure to recommend. If you are a regular fan of the Christian fiction genre, this is one you are going to like! I can think of no reason why you would not. If you have a moment, I would encourage you to visit Christian Book.com to read a very interesting interview with C.J. Darlington. I was going to interview her myself but found this particular interview to be so thorough, I didn't think I could add very much to it! Enjoy! THIS POST ORIGINALLY PUBLISHED AS A GIVEAWAY. THE CONTEST IS NOW CLOSED. I'm commenting! :-) This books sounds good. I'm in. Thanks for the contest. would love to read the book. Thanks for the Great Review! I've been eyeing this book, and would luv to have a copy! I've been curious about this book for months now. I'd love to win! I'd love to read this! Thanks for the giveaway. I don't normally read fiction (other than to my kids) but you've made me curious to read this one! 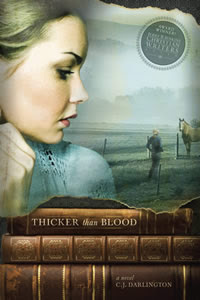 Please enter me in your contest for Thicker than Blood. I would love to read this book. It sounds like the perfect blend of genre, characters and personalities for me! This book sounds amazing, please count me in for this giveaway. Throw my name in the hat! I've been looking forward to reading this one. Please enter me:) I would love to read this book!! Thanks! This book looks very interesting. My "to read list" is so big, but I always can grow it up. Thicker than Blood sounds wonderful.Please enter me in the giveaway.augustlily06(at)aim(dot)com.Thank you. I really want to read this one! I'd love to be entered. I'd love a chance to win Thicker Than Blood. Thanks! Sounds like a great book. I am all about good Christian fiction, so I would love to read this book! I barely noticed the heroine because I was looking at the books in the cover picture. Then when I read the part about her being a book dealer? My kind of story (and heroine). Please count me in! Whenever possible I like Christian fiction to my classroom library. I especially look forward to adding this book, because the author was home schooled ---- I'm hoping it will serve as an inspirational message on several levels. I'd love to read this book. Thanks for the possibility. Here's my comment! ;) This sounds like a really interesting book and one I'd like to read. Carrie... thanks so much for this wonderfully thoughtful review. It's especially fun coming from another homeschool graduate! Thanks for sharing! The books sounds great. Looks like it would be a great read. Sounds like a very interesting and touching book. I would really enjoy reading it. Please enter me. Thanks! I follow CJ Darlington on Twitter and have been very curious about her book. Sounds good! This looks great! Please enter me! Sounds interesting. I'd like to check it out. This book sounds really interesting! I'd love to win a copy. I thought I'd left a comment...but don't see it. I'd like to read this too! This book sounds so good. Count me in for the contest. I found your blog through 5 minutes for books, i'll be back to visit again. Would love to read this. Please enter me.